EXCLUSIVE: HBO and Amazon are developing their respective controversial alt-history series Confederate and Black America for the small screen, but Studio 8 is aiming bigger with Black. With its premise of a nation where only African-Americans possess superpowers, the comic series from Black Mask Studios has been optioned for a feature by the Jeff Robinov-founded company, I’ve learned. Studio 8 EVP Creative Jon Silk brought the project into the fold and will oversee its development with executive Rishi Rajani. Representing Black Mask as well as the Black creators, the deal was with Studio 8 negotiated by Matthew Sugarman at the L.A. office of Weintraub Tobin. Having just wrapped its initial six-issue run, the series created by Kwanza Osajyefo and Tim Smith 3 starts with a police shooting in Brooklyn that sees teen Kareem Jenkins survive a hail of bullets and discover that he is a lot more powerful than he ever knew. As Jenkins connects with others who share similar powers, a widespread oppressive global conspiracy to keep the knowledge of such superpowers from the world — and especially the black community — themselves is unveiled to all. 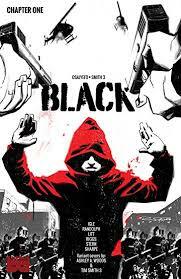 Ex-Marvel and DC digital editor Osajyefo and Smith are attached as co-producers to the Black pic, with Black Mask Studios’ Matteo Pizzolo producing. Founded in 2013, Black Mask’s pretty full slate has been attracting a lot of attention of late for its publication of modern day secession and civil war series Calexit, which Pizzolo co-authors with Amancay Nahuelpan.